Myanmar is currently in crisis. Last week, for the first time, the United Nations (UN) officially called for top Myanmar military officials to “be investigated and prosecuted” for genocide of the Rohingya people in the northern Rakhine state as well as for crimes against humanity and war crimes under international law. Currently, the focus on Myanmar remains on the northern Rakhine state where the crackdown led to nearly 700,000 Rohingya having to flee over the border to neighbouring Bangladesh. The findings of the UN mission revealed that the crimes carried out by Myanmar’s armed forces – also known as the Tatmadaw – were not just against the Rohingya in Rakhine, but also in Kachin and Shan where there are also ethnic conflicts. Due to the magnitude of the crisis in Rakhine state, the crisis there receives most – and rightly so – of the global media’s attention. 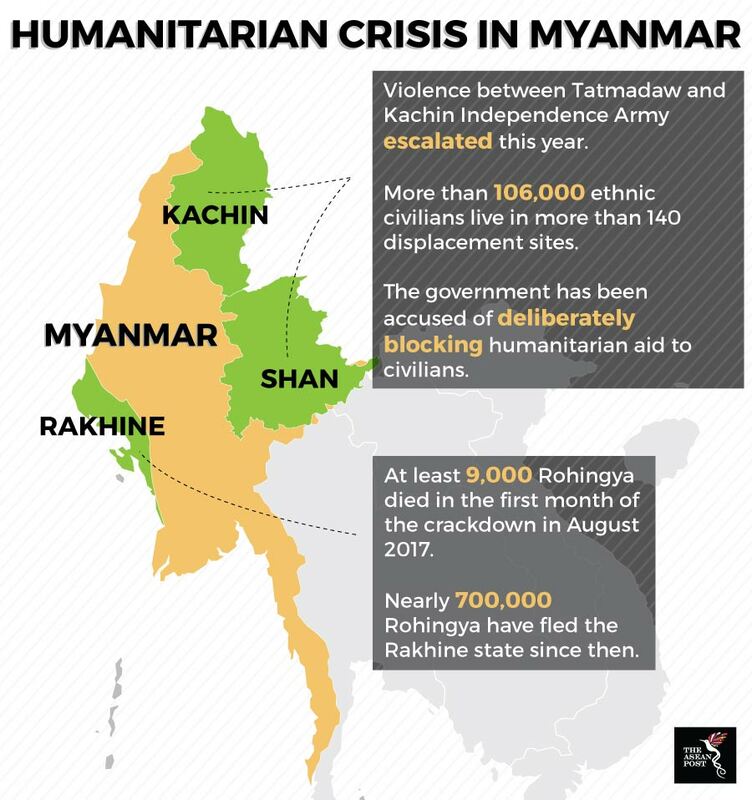 Because of this, the Kachin conflict in Myanmar has gone underreported despite the alleged war crimes that the Tatmadaw has carried out there. As such, the war in Kachin has been dubbed the “forgotten conflict”. Ever since a government ceasefire between the two sides broke down in 2011, fighting between the Tatmadaw and Kachin Independence Army (KIA) has escalated. This year has seen a dramatic spike in violence and data shows that there are currently more than 106,000 ethnic civilians in more than 140 displacement sites in Kachin and Shan states. The Tatmadaw has come under criticism for using disproportionate violence in the Kachin state. The military have reportedly carried out air strikes and used heavy weapons in civilian areas. The deployment of the 33rd Light Infantry to the north-eastern state has also raised concerns among human rights activists. The infantry is the notorious army unit accused of various human rights abuses against the Rohingya in the Rakhine state. This week, Fortify Rights, a human rights organisation based in Bangkok revealed more damning evidence of the Tatmadaw’s crimes. The organisation claims that the government of Myanmar has systematically denied civilians humanitarian aid. According to Fortify Rights, the military is “weaponising the denial of humanitarian aid” by deliberately denying displaced peoples of essential resources such as food, water, healthcare and shelter. The 68-page report reveals that the government there has imposed unnecessary travel restrictions on humanitarian aid organisations. It revealed that from June 2017 to June 2018, the government approved only five percent of applications submitted by international humanitarian agencies seeking travel authorisation to assist the displaced communities. Requests for access to areas under the control of the KIA were even harder to obtain. Because of all the difficulties in accessing such areas, many aid organisations have given up on submitting requests to the government, further limiting aid to the victims of the civil war. Some other groups have also said that they were forced to evade government restrictions to reach the displaced community there, which would put aid workers in extreme danger. The revelations of the past month highlight the atrocities in the country. However, the international community are still struggling to figure out how to make the government and military in Myanmar accountable. Sanctions imposed by the United States (US) and the European Union (EU) have thus far proven ineffective. Aside from that, Myanmar’s major allies such as China have kept mum on the issue. As long as it continues to receive funding and has the backing of a large power such as China, the government in Yangon will continue doing what it wants. It is time for the international community to come together and condemn these crimes against humanity. Otherwise, they could find themselves on the wrong side of history.